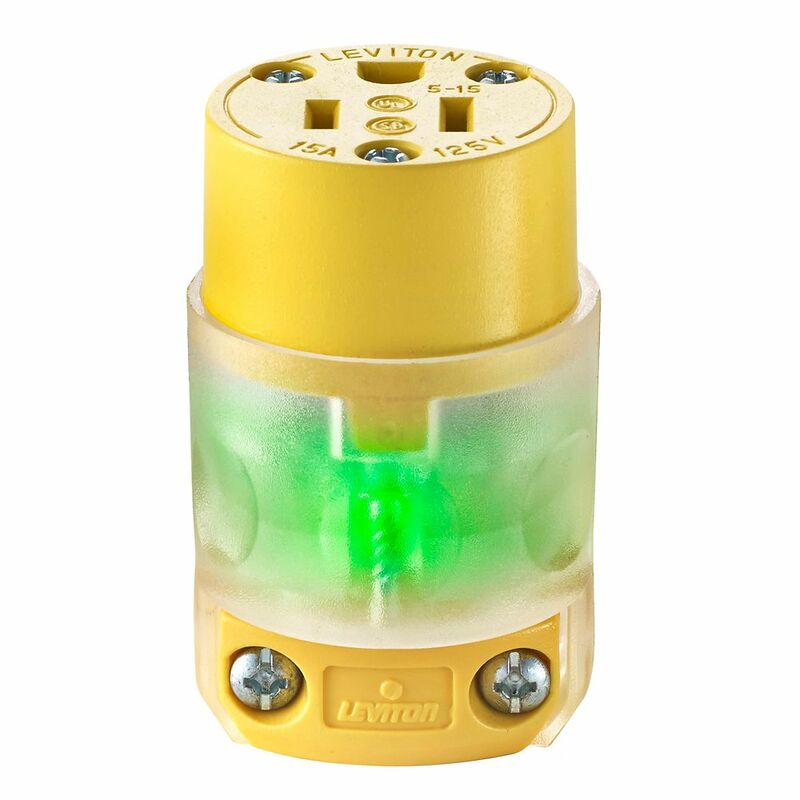 15 Amp, 125 Volt, NEMA 5-15R, 2-Pole, 3-Wire Connector, Straight Blade - Clear with LED Leviton offers a large selection of 15, 20, 30 and 50 Amp Straight Blade Plugs and Connectors, available in a wide variety of features. These rugged performers are moisture, chemical and abuse-resistant, And they're ideal for indoor and outdoor use. Our EPTR rubber-backed plugs and connectors stand up to rough use, protecting against dirt and moisture. The deep-slotted, backed-out terminal screws draw back wire clamps securely over stripped leads for maximum conductivity. 15 Amp, 125 Volt, NEMA 5-15R, 2-Pole, 3-Wire Connector, Straight Blade - Clear with LED is rated 4.1 out of 5 by 77. Rated 5 out of 5 by Jimbo from This clear lighted female connector was exactly what I needed to complete my new extension cord. ... This clear lighted female connector was exactly what I needed to complete my new extension cord. The lighted feature lets me see from a distance that I have power before I start my project or before I walk the distance to my work area. There is nothing worse than getting to a work site and not having electricity. Rated 5 out of 5 by JohnF from I have a 100 ft extension cord that I use... I have a 100 ft extension cord that I use to provide power to my RV ( to keep the batteries charged and firidge cold.) It's too long, but the UV has already affected the exposed portion, so I cut it into 2 cords. (Both ends are protected from rain, sprinklers.) This plug was very easy to install; just be sure to notice the "tongue and groove" alignment guide between the orange and clear portions. If you don't realize it's there, you will spend quite a few frustrating minutes trying to align the parts.I will definitely buy it again.